Saxophonist Tommy Smith has become somewhat of a ubiquitous presence on jazz's international stage with his work with the Arild Andersen Trio and the Scottish National Jazz Orchestra bringing in plaudits from around the globe. His music has always been far reaching, ranging from repertoire drawn from jazz standards and the Great American Songbook in his longstanding duo with pianist Brian Kellock to large scale works commissioned to be performed with the SNJO and guest musicians that have included Makoto Ozone, Mugenko Taiko Drummers, Kurt Elling, Joe Lovano and Bill Evans. 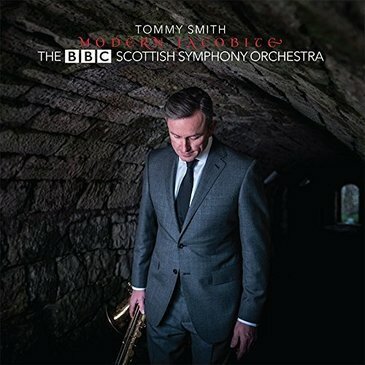 However, perhaps the biggest surprise, although one we should have seen coming, was his recording with another Scottish 'big band', the BBC Scottish Symphony Orchestra, Modern Jacobite featuring the saxophonist's first recorded symphonic composition. Smith has long held an interest in classical music having spent a considerable amount of time studying and understanding this contrasting musical idiom, which is far removed from his usual modus operandi. As far back as 1989 the saxophonist was heard performing with the BBCSSO in William Sweeney's concerto 'An Rathad Ur' for the BBC television series Jazz Types which Smith also presented. Following this, there was an intense period studying orchestration and Tommy's first classical composition, 'Unirsi In Matrimonio' was premiered in 1990, which invigorated much TV coverage and interest from film makers like Peter Greenaway. Since then the saxophonist has written another work for strings and saxophone with his composition ' Un Homme Écossais à Paris’ (1991) and performed extensively with Scottish pianist Murray McLachlan having written two sonata's, 'Sonata No 1 Hall of Mirrors' and 'Sonata No 2 - Dreaming with Open Eyes' that the duo recorded for the album, Gymnopédie released on Linn Records in 1998; and his concerto Hiroshima was performed at Chelmsford Cathedral by the Orchestra of St. John Smith's Square in the same year. music evolves and metamorphoses thematically idea after idea. It was a tough few months but after studying classical orchestration since 1989 it was second nature to write an organic piece that would work for a symphony orchestra; albeit music that wasn’t cutting edge universally but at least cutting edge for me personally. It had taken this long to get something documented in this field because I had always focused on my jazz output and delving into the classical world was always shunned by all; even though, I had written concertos, and sonatas for more than twenty five years." The album opens with a beautiful orchestration of one of Rachmaninoff's famous Fourteen Songs, 'Vocalise', which is full of rich harmonies and textures from the orchestra. Tommy takes up the story. "I happened to be playing golf with Branford Marsalis at Kings Barns in Fife, we’ve played a fair few times together, and Bran is a good friend of mine, so I asked him what pieces are really great for saxophone and since he’s performed and recorded so much of this genre he gave me some friendly advice. The key I chose for the performance of 'Vocalise' is E minor, which is really wonderful for the strings, as they truly sing and vibrate. However, the key of F# minor for the saxophone isn’t a happy place, but because I had been working with Arild Andersen for many years this key was a familiar and popular place to be and I really felt at home there, especially as the strings sounded so sonorous and vibrant. The harmonic structure of Rachmaninoff’s 'Vocalise' is incredibly complex compared to jazz progressions and care was needed to navigate the various pathways you must venture down." 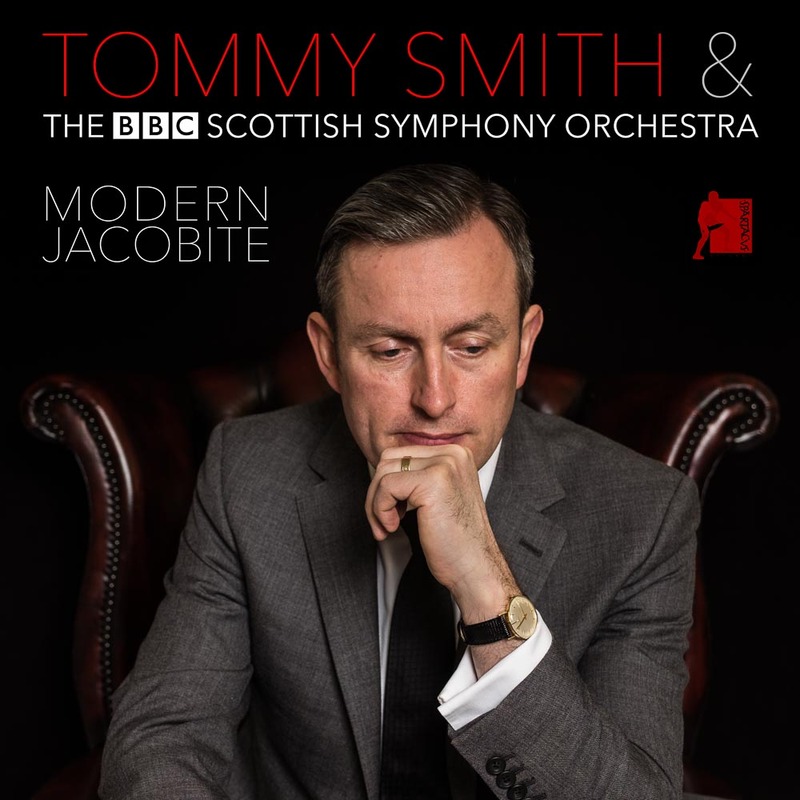 The centrepiece of the album, 'Jacobite' is Smith's thirty minute symphonic work featuring saxophone in three movements, with each part given a specific date within the Jacobite uprisings of the 19th century, an historical event that the saxophonist has visited in the past with his 'Culloden Moor Suite' written for the SNJO and guest soloist Bobby Wellins. As one would expect, the is music very passionate and full of events recounting this epic time in Scottish history, so I asked Tommy why he chose to revisit this theme once again. "Well, it’s simple really," Smith replied, "I had to write something powerful for the BBCSSO in that short period of time between February and May 2016 and the thematic material from the 2014 Independence referendum, my epic poem ‘Independency’ and Scotland’s powerful and animated history proved to be fertile ground for such a piece that featured an antagonistic saxophonist like me." Hearing 'Jacobite' is an experience that pulls the listener through a bloody and traumatic time in history, with the saxophonist at times taking on the role of narrator, stepping out alone from the orchestra to tell the tale, and after the drama and intensity of the three part work the album's final pieces relieve the tension with some pieces that are familiar to a jazz audience with Chick Corea's 'Childrens Songs', and which the saxophonist has performed and orchestrated previously interspersed with his own 'Bairns Sang'. "In 2001 I was invited by the Scottish Ensemble to perform one of Chick Corea’s Children’s Songs, arranged by someone else" explains Tommy. Unfortunately, I didn’t like the arrangement, and asked the Ensemble if they’d allow me to write the arrangement instead. They said sure, and what started as a 5 minute piece ended being 60 minutes; I simply couldn’t stop arranging Chick’s music and adding to it. And I was writing for no remuneration, only for the sake of the music. Quite an enlightening experience! For this orchestral arrangement with the BBCSSO I had to edit the music down from 60 minutes to 11 minutes – that was an incredibly challenging experience, being forced by myself to delete much more than was created. The entire recording wasn’t commissioned in any way shape of form so the musical decomposition was coming from a place of purity; music for music’s sake." Smith's credentials as a forward thinking contemporary jazz musician are beyond doubt. What is interesting is that when writing for classical orchestra he has not just dipped his toe in the water and sought to juxtapose the classical world with his own chosen idiom, but stands outside his comfort zone fully immersing himself in the classical genre, so I ask Tommy as an improvising musician what attracts him to this area of music? Pausing to consider his response, the answer is simple and direct. "Purity. Control. Beauty. Dynamics. Expression. Texture. Acoustics. Playing the same constricted thing a multitude of ways, because I can." Elaborating he adds, "I just don’t like the classical approach to saxophone. I believe that the instrument has more potential for self-expression than most people in that genre believe or experience. You have to be yourself and express your own individuality in way that transcends that narrow, clichéd, technical porthole that classical saxophonists inhabit." With the release of Modern Jacobite it is arguable that this is perhaps one of the saxophonist's greatest achievements, in any genre, and certainly one of his most personal of statements. He has clearly put his money where his mouth is, and laid his reputation on the line with such bold new music, so what has been the reaction to the album among the jazz and classical fraternities (and critics) and have there been any problems in presenting this music to his established or indeed new audience? "Well, it would appear that many jazz critics hated the idea of it, and some wouldn't even entertain the recording being sent to them. There were of course notable exceptions like John Fordham (Guardian), Stuart Nicholson (Jazzwise) and of course some kind words here on Jazz Views. The classical critics pretty much turned their noses up at the recording because of the improvised elements and the fact a jazz saxophone is involved; although, it is a purely classical recording!" says Smith. "Shame on all of them who adopted that attitude – take a chance, be daring – live a little. Mozart would have loved it, and a great improviser he was. Anyway, as Sibelius once said, ‘There has never been a statue erected to honor a critic,’ and Anthony de Mello said, ‘Statues are for the criticized’. The public enjoy their own opinion too much these days, and good for them. Of course, both the jazz and classical worlds will always avoid this grey, nebulous area of my mischievousness. I do it purely from a place of desire, integrity and freedom. These days, it doesn’t seem worth caring anymore about what the misguided pen of the average hack reveals or ignores. I can only continue to create what I believe in, even if I’ve alienated many in the process. From the five hundred promo CDs I sent to journalists and radio producers only seven responded with positive energy, particularly Andrew McGregor at the BBC Radio 3, all the rest were silent. Funnily enough, several radio stations in the USA are playing tracks from the recording, how crazy are they?" If there is some indifference to Modern Jacobite in some closed circles, there are those out there with more open ears and willingness to shift there own musical perceptions and be receptive to those of others, and also a possibility that the music will be performed live. "Well, the Edinburgh Youth Orchestra wish to tour Jacobite through the UK in 2018", says Tommy. "Perhaps, the professional orchestras will pick up the baton also! Unfortunately, none of the classical agents nor press officers I contacted would take me on as a client, so at some stage soon I’ll have to write to the orchestras personally to promote my wares." For more information visit Tommy's website & Spartacus Records. Click on the album cover to read our review.